The Cuban Cultural Festival, which took place at the London Hilton Hotel from October 31st to November 11th 2002, was an opportunity to learn more about Cuban cigars, which showed beyond compare their exceptional quality. Leonor Cespedes, professional cigar roller, was part of the festival attractions and we had a chance to ask her a few questions about her trade. 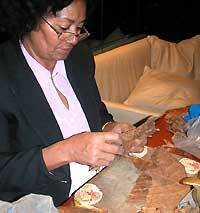 Cuba Heritage.com: Leonor, how long have you been working as a cigar roller? 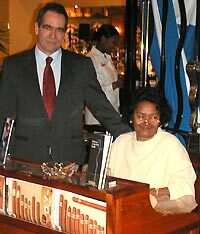 Leonor Cespedes: I have been working for Romeo y Julieta Cuban Cigar Brand, in Havana, for 35 years. Cuba Heritage.com: What influenced you to become a cigar roller? Leonor Cespedes: The ‘Romeo y Julieta’ Brand wanted to hire women. I was offered the job and I agreed. And since then, I have been learning all secrets to make the best cigars and I am even teaching cigar rolling! 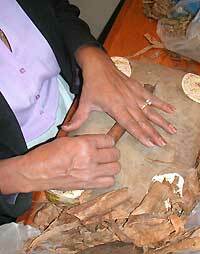 Cuba Heritage.com: So is it necessary to make studies to become a cigar roller? Leonor Cespedes: Yes, you need to take a nine-month course in Cuba nowadays. Cuba Heritage.com: Can you give us the most important qualities you think a good cigar must have? Leonor Cespedes: The quality process is very rigorous and we have quality technicians, called “tabaqueros” who check every step of the making process, from the tobacco harvest to the packing. The characteristics you have to pay attention to are the quality of the wrapper (outside leaf), the smell, the body and the flavor. Cuba Heritage.com: I heard that you happen to be the best cigar roller in Cuba. What is it that gives you the passion of cigars? Leonor Cespedes: I have always been hard working. I know that the cigars I make will go round the world representing Cuba, so they have to be the best. I am proud to work for ‘Romeo y Julieta’ which is the best cigar brand. Now the best tobacco is given to me to make the best cigars, so it is my duty to turn good raw materials into an exceptional product. Cuba Heritage.com: Thank you for your time. Bye. Leonor Cespedes: My pleasure. Bye.